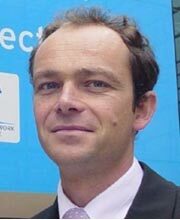 Rémy Dénos is Policy Officer in the field of Energy Technologies in the Directorate General for Energy at the European Commission. He is involved in the definition of the Horizon 2020 Work Programme for smart grids and energy storage and coordinates the BRIDGE initiative. He worked previously as a Scientific / Research Programme Officer in the field of aeronautics (2006-2014) in the Directorate General for Research and Innovation. Before joining the European Commission, Rémy worked as a research engineer for Gec-Alsthom in the field of steam turbines and then at the von Karman Institute for Fluid Dynamics (Belgium) in the field of gas turbine (1996-2000) where he was Professor (2000-2006). He has an engineering degree and a PhD in the field of Fluid Mechanics from the University of Poitiers.